Passing of the Traveling Child Parade – Part 2 – A Highlight! 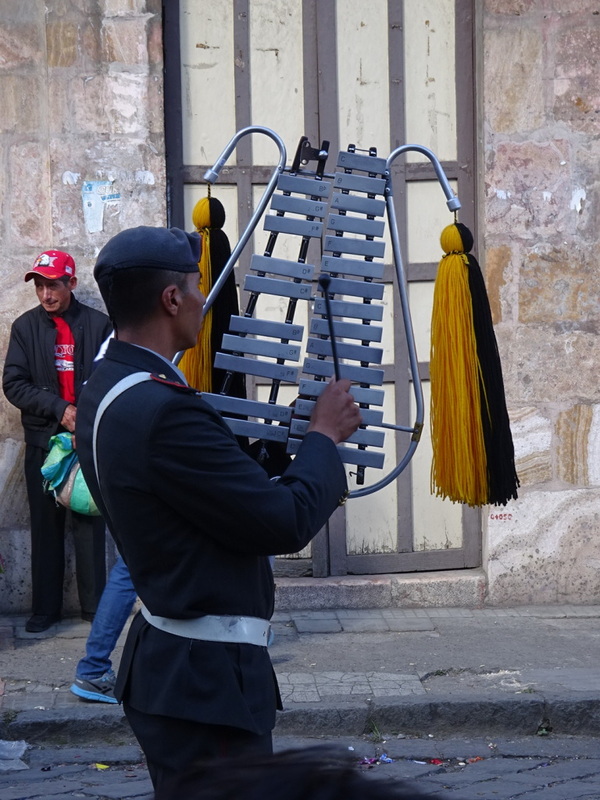 Posted on December 25, 2014 by No Map Required Posted in Ecuador, Places	. 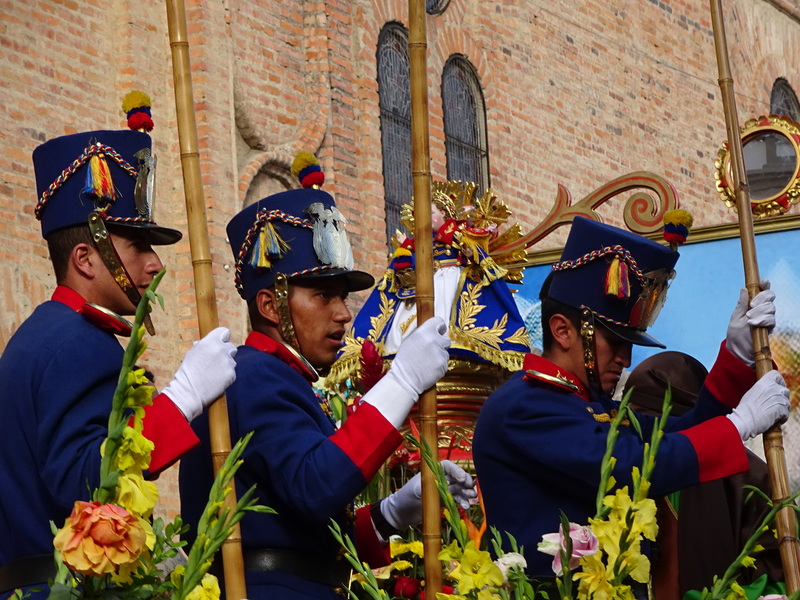 Cuenca, Ecuador – Pase del Niño Viajero (Passing of the Traveling Child Parade) – A Highlight! At one point while watching the parade (easily 6+ hours after the start) we saw that a very special float was coming. It was the most elaborate and perhaps most beautiful float in the parade – covered in professional flower bouqets, unlike any other float. This float was lead in by dignitaries and military men, along with a huge entourage before and after. 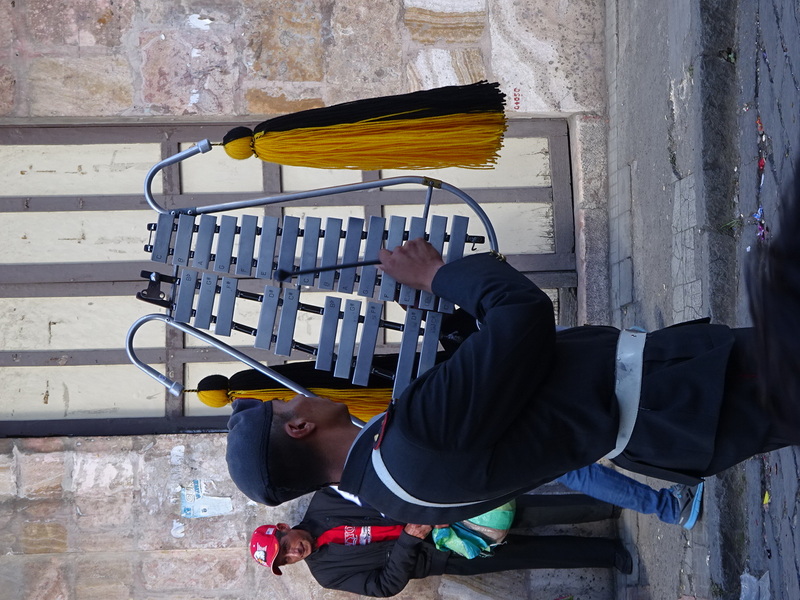 There were large groups of soldiers in camo, officers in uniforms covered with medals, and soldiers in traditional/colonial uniforms with a military band leading the way and a group of altar boys following behind. A woman walked in front throwing rose petals. There were big ropes that some military police carried to kept the crowd out of the procession. When it went by there was a crush of people following. Everyone wanted to be near it. Intially we didn’t know what to think of it, except that it was a float with clout, but eventually we figured it out. 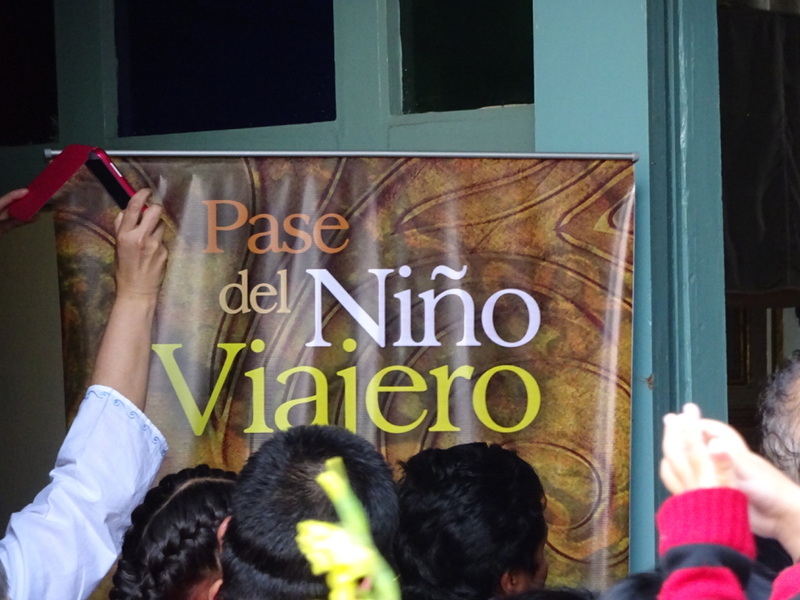 This was it – this was the float with the Niño Viajero! The special float. No other float was decorated like this one. 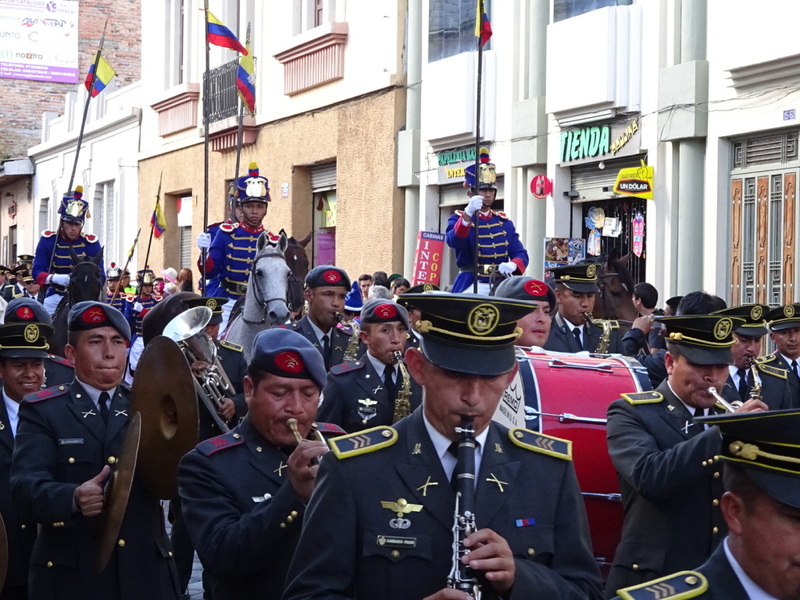 The military band lead the traditional dress military who lead the Float. 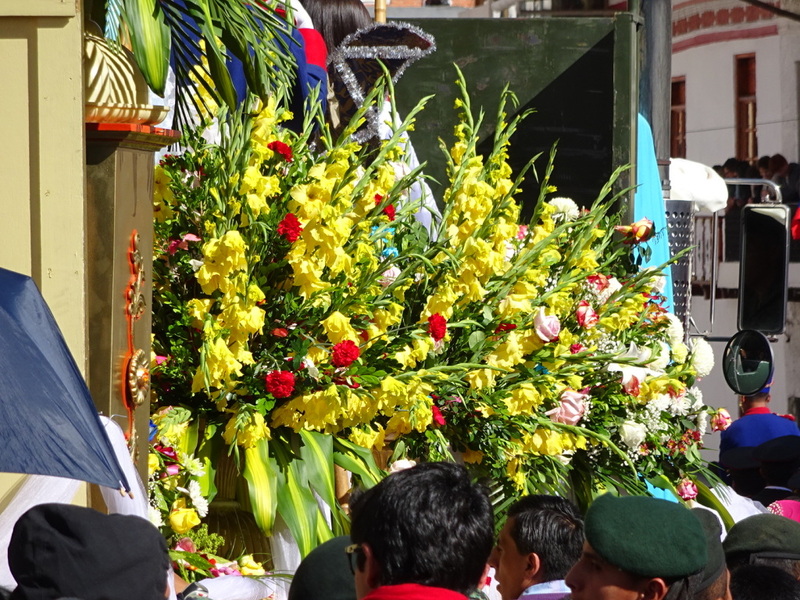 According to the local newspaper, “The centerpiece of Cuenca’s parade is an 1823 sculpture of the infant Jesus that was commissioned by Cuencan Josefa Heredia from an unknown artist. When the sculpture came into the possession of Cuenca Monsignor Miguel Cordero Crespo more than a century later, the Monsignor took it to the Holy Land and Rome in 1961, where it was blessed by Pope John XXIII. 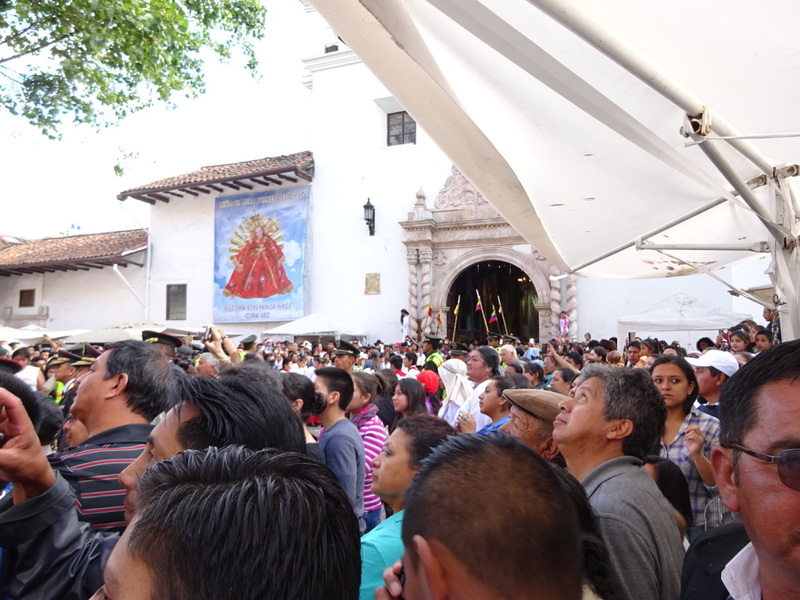 After the journey and the anointment, the statue became known as Niño Viajero, or Traveling Child, and has been the parade´s main attraction ever since.” And we happened to see it! As we were preparing to head home, we walked past one of the giant churches of Cuenca where it was clear something was happening so of course we had to take a look. 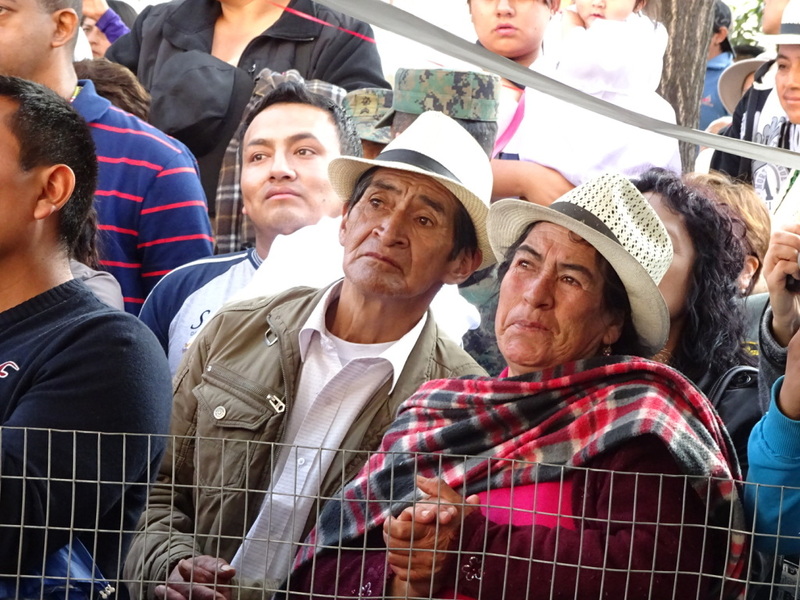 It was a mostly Ecuadorian crowd waiting outside the entry to the church, which was corridored off, and we waited to see what would happen. It was very quiet …with the exception of the occassional confetti cannon. Confetti cannons at church! Yep, things are a bit different here. 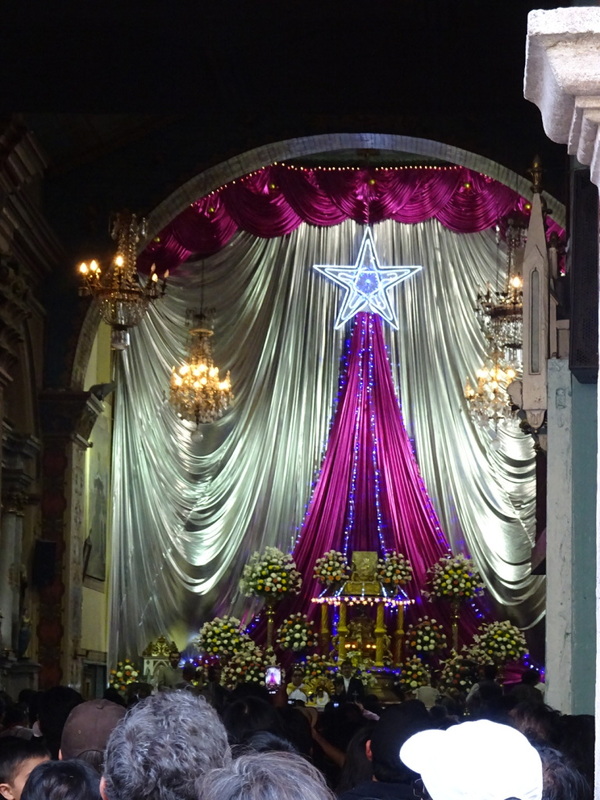 Anyway, as altar boys and soldiers lined the path to the church keeping the rest of us back, The Float slowly appeared! The crowd in front of the church. On-lookers at the church. Some came just for the parade, others, like this couple, were there for the religious ceremony. The traditional soldiers. Sadly we didn’t get a good shot of the sculpture, but it is right behind the spear-tipped bamboo flag pole the middle soldier is carrying. I promise. Then we saw it: the special carved baby Jesus! A priest on the float very carefully lifted it and the crowd became even more hushed. As the priest (older fella) tried to get off the flat-bed truck he slipped to a huge gasp from the crowd! Luckily priest and the sculpture were a-okay. They walked down the corridor to the church and the crowd clapped. The lady with rose petals tossed more petals, now with lots of other people tossing petals to the ground. 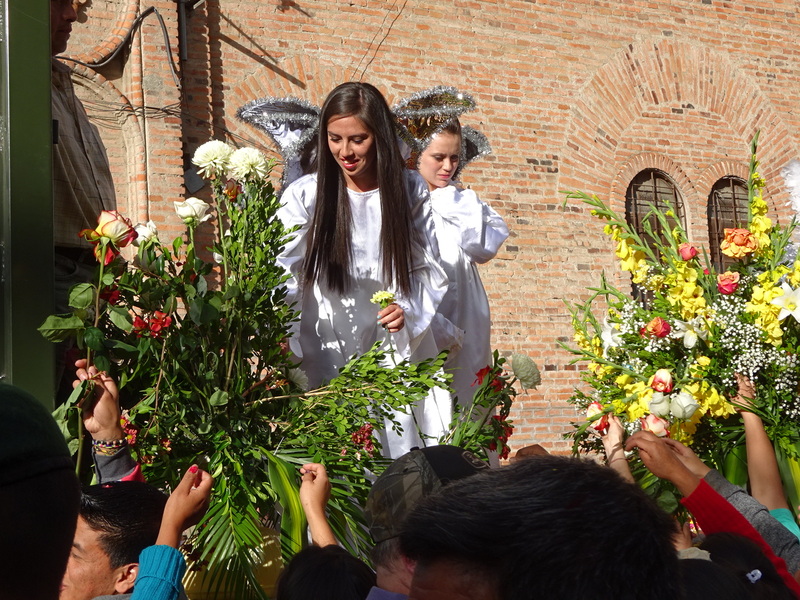 As soon as the priest entered the church, the crowd lunged for the flowers on the float. The angels who had been part of the float’s nativity scene helped pluck roses and lilies for the outstretched hands begging for them. We are not sure if folks wanted to take them home or into the church later, but it was obviously a blessing to have the flowers that had been so close to this particular sculpture. Angels helping pass out the float’s flowers. The Church… well, picture this: the entire area behind the altar was lavishly covered in silver and irridescent purple fabric. On the altar were humungus, perfectly prepared bouquets of flowers. At the ceiling was a light-up star with chaser lights streaming down it. You read that right – chaser lights! (for the record: chaser lights AND confetti cannons!) After watching for a bit, Aaron and I pushed our way out of the crush and shook our heads, never having seen anything like it, but feeling lucky that we got to pay witness to this local tradition. The Altar. Teeny-tiny at the front are the priest in a yellow cape and the baby Jesus. 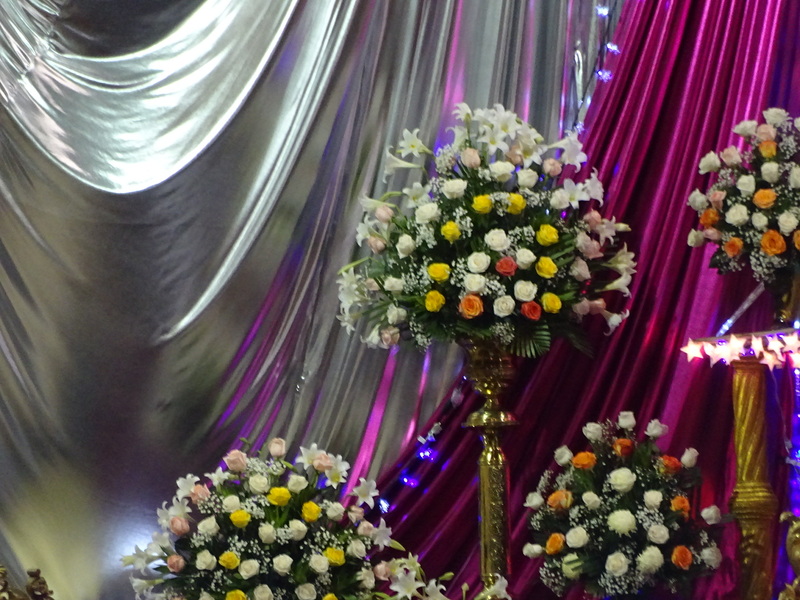 The flowers and light-up stars on the altar. Sign at the front of the church. For those who celebrate, we hope everyone had a Merry Christmas, Happy Hanukah, and Happy Solstice. We’ll be spending Christmas Day here in Cuenca with our wonderful charge, Doyle and, in keeping with our Seattle Chrismanukah tradition, we plan to have Indian and watch a movie…we’ll just have to cook the Indian ourselves this year! Happy Holidays! Loved seeing and reading about your experience with the parade and rituals around the traveling baby Jesus!